Guys can be hard to buy gifts for, especially when if comes to finding a memorable kid’s Father’s Day gift idea. I find that I’m always racking my brain for a cute gift but this year I got it! 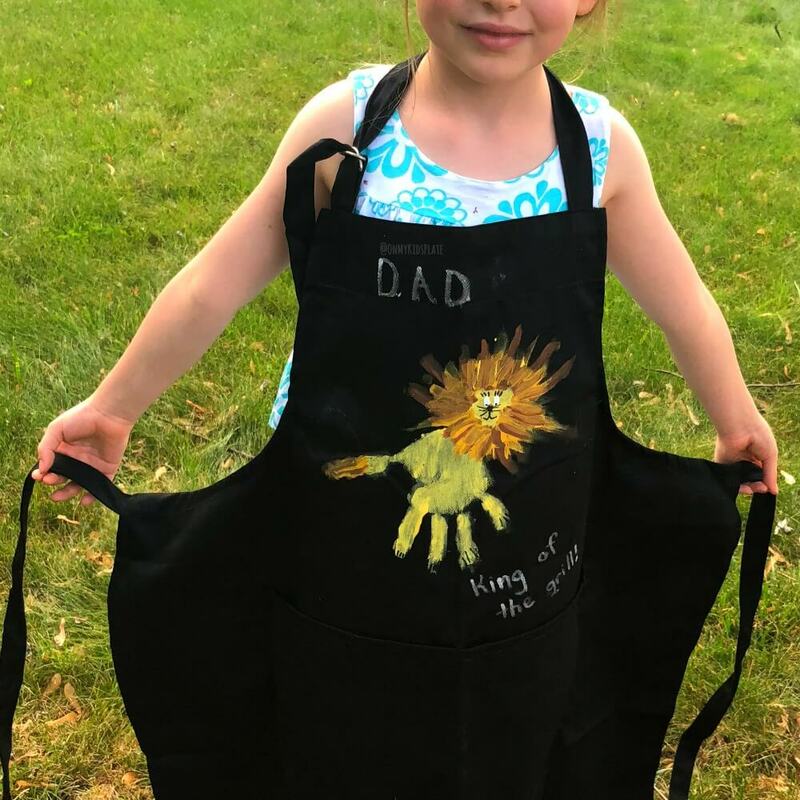 This DIY handprint BBQ apron gift is perfect if your guy likes to grill. 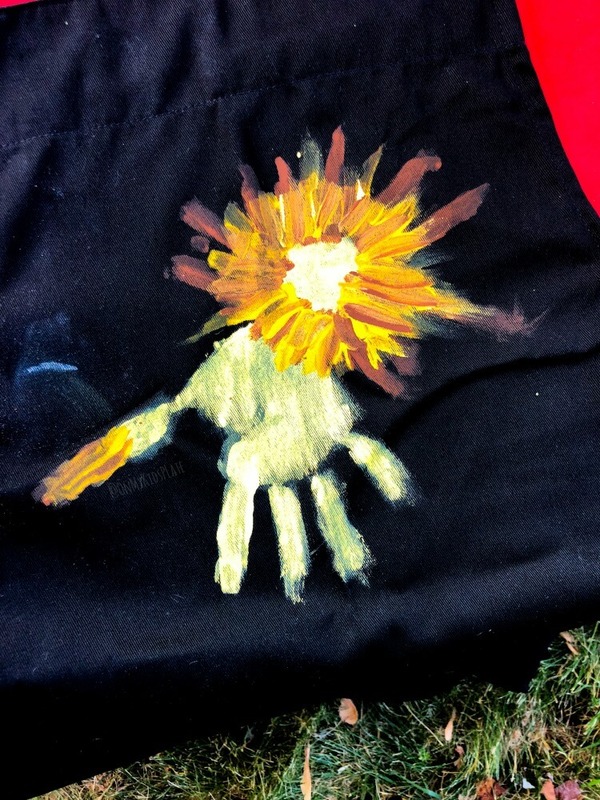 He is going to love this sweet lion handprint on this “King Of The Grill” apron, and I bet he will wear it proudly. This is a DIY craft that kids and preschoolers can make themselves, and Dad will love looking back on how small the kid’s hands were! *Some affiliate links are included in this post to products we love or think may be helpful for you. My husband has a huge soft spot when it comes to the kid. When special days like Father’s Day, his birthday or even the holidays I want something that’s a little sentimental for him too. One easy way to do that is with a sweet little handprint craft. I know we both cherish looking back on just how tiny the kid’s hands were! Does your guy love to grill too? I swear mine could spend the whole summer by the BBQ, and we are often still grilling well into the fall… some years we are still BBQ into the holidays! So a bbq themed gift will be a big hit. I’m sure this King of the grill” handprint lion would also make a sweet gift for a grandfather, or another special guy in your life. I was pretty impressed, this BBQ apron didn’t take very long to make. The apron tended to soak up the paint fast, so it didn’t take long for this one to dry. You could easily make more than one lion if you had more kids. We started off by putting a big yellow handprint in the center of the apron, and then let it dry. If you’ve never done handprint art before it helps if you treat your kid’s hand like a giant rubber stamp, and help to gently press their fingers onto the fabric. The very first time I did a handprint craft like this, I practiced on a piece of paper first. Now is where the kiddo can get a little more creative. Paint a yellow circle for the lion’s head, and let your kid fill in the circle. With a smaller brush, have them make short brushstrokes out for the mane. I gave my kid one color at a time, we worked on first the brown and then adding the yellows. If I was letting her paint a picture I’d probably just let her go wild, but because this is a gift I expect we will keep for a long while I helped her through it a bit more. For some young children, you can tell them you want the mane to be a pattern. Remind them the order of the colors (first brown, then orange, then yellow!) and that will help the mane turn out cute. Add a couple brushes of color at the end of the lion’s tale. Even if the man turns out only in brown? The little lion will still be adorable and your guy is still going to love his kids Father’s Day gift idea. Add two white circles for the eye pupils. 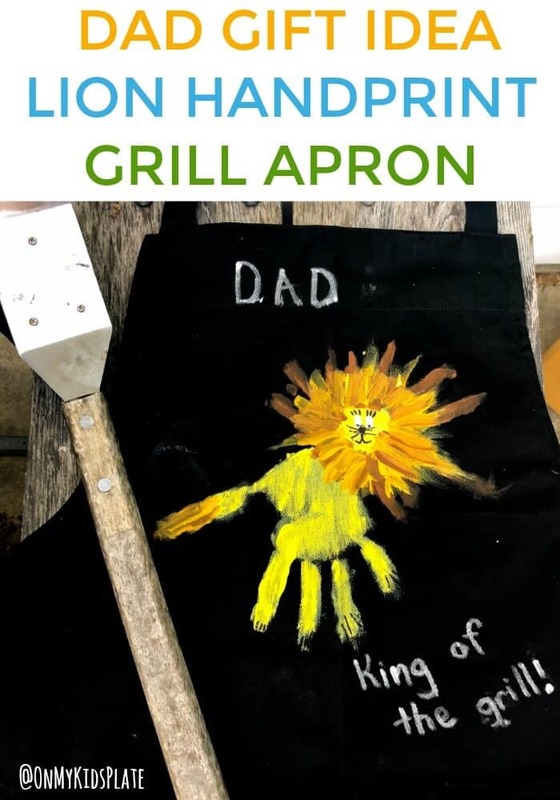 Use a paint pen to write the words “Dad: King of the Grill” on your apron. Or maybe you are writing “Grandpa: King of the Grill,” or “Uncle so and so, King of the Grill.” Trust me, he’s going to love it! Let the whole project dry a bit more. After the lion is dry, add the eyes, face, and paws with a black permanent marker. You might have a few smears where the kid dribbled paint. Since my apron was back, I fixed a smear with a black permanent marker. Some smeariness just adds character though, right? 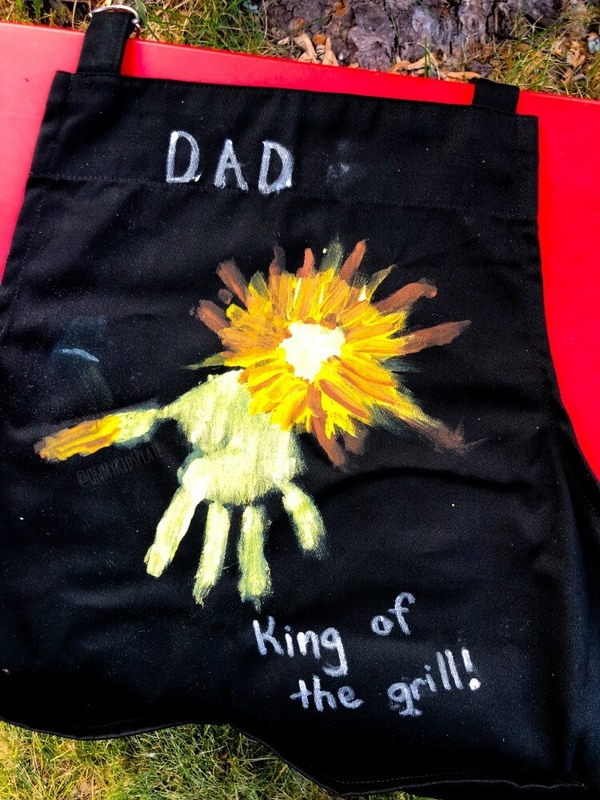 Use a paint pen to write the words “Dad: King of the Grill” on your apron. Or maybe you are writing “Grandpa: King of the Grill,” or “Uncle so and so, King of the Grill.” Trust me, he’s going to love it! Lay the apron on a paint-safe surface. Paint your child’s hand with yellow paint and gently stamp it like a rubber stamp in the middle of the apron with the fingers facing down. Using the small brush, encourage your child to paint a yellow circle as the head. Encourage your child to use the brown and the skinny paintbrush to paint the mane around the face and at the end of the tail. Once you’ve added the brown, add in a layer of yellow but letting the brown still show through. Let the apron dry for at least an hour. Using the white paint and the skinny brush, add two small white eyeballs. Using the paint pen, write your message on the apron for Dad. Let dry for 20-30 minutes. Take the black permanent marker and draw in dots for the eyes, whiskers, and lines on the paws. 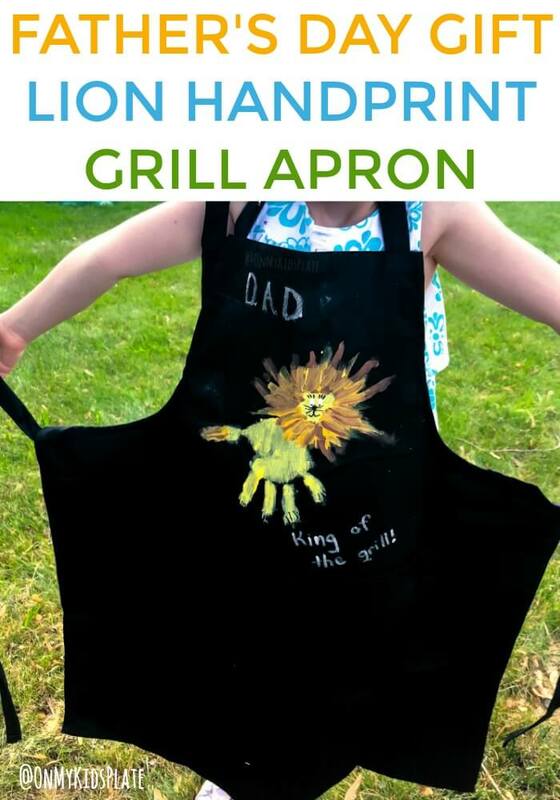 That’s it, you now have a fantastic Kid “King Of The Grill” Lion Handprint BBQ Apron. Give this as a gift for Father’s Day, a birthday or even the holidays for your favorite BBQ loving dad or another important guy in your kid’s life.